You’ve probably had this experience: Your printer tells you it’s time to change the cartridge, but you dismiss the message and keep printing. Days or weeks later, you’re still using the same cartridge and thinking to yourself that rumors of its death were greatly exaggerated. Or perhaps your printer simply shuts down when it decides you’ve gone deep enough into its ink well, refusing to operate until you replace the cartridge, though you suspect there’s plenty of ink left. We decided to do some real lab testing on this issue; and the results confirm what you may have suspected: Many manufacturer-branded (OEM) and third-party (aftermarket) vendor cartridges leave a startling amount of ink unused when they read empty. In fact, some inkjet printers force users to replace black ink cartridges when the cartridge is nearly half full, our study found. See Macworld’s buying guide to inkjet printers. We tested using multifunction printers from four major manufacturers: Canon, Epson, Hewlett-Packard, and Kodak. PC World Test Center results show that models from Canon, Epson, and Kodak reported ink cartridges as being empty when in some cases the tanks had 40 percent of their black ink remaining. 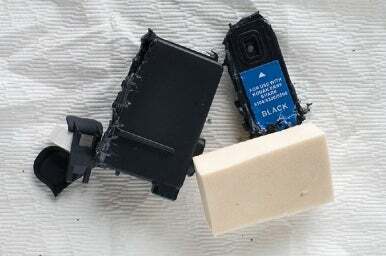 The quantity of unused ink ranged from about 8 percent in an Epson-brand cartridge to a whopping 45 percent in an aftermarket cartridge for a Canon printer. After posting low-ink warnings, those printers wouldn’t let us resume printing until we inserted a new cartridge. Our test printers typically left more unused ink—in some cases significantly more—when using third-party or aftermarket print cartridges than when using the printer manufacturer’s own cartridges. 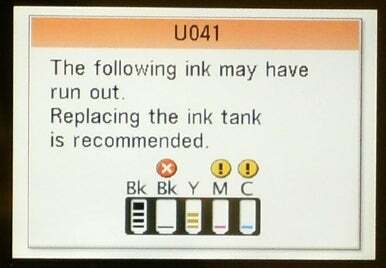 When using ink their own manufacturer’s cartridges, the printers displayed several low-ink warning messages before finally shutting down due to low ink. Our HP printer, the Photosmart C5280, was the only one that continued to print even after displaying several low-ink messages, and those messages appeared only when we used an HP print cartridge. When we paired the C5280 with an aftermarket cartridge from LD Products, the printer provided no low-ink warning at all. Check out the PC World video that accompanied this story. Other people, however—both journalists and independent researchers—have reported very different experiences with ink cartridges. 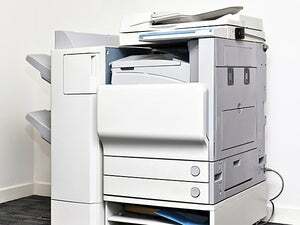 Judging from these findings, printer owners are probably throwing away a lot of usable ink. And that’s a problem, when you consider how expensive the precious fluid is. An average black-ink cartridge contains 8 milliliters of ink and costs about $10 which translates into a cost of $1.25 per milliliter (or more horrifyingly, $1250 per liter). If you bought a gallon of the stuff over the life of your printer, you’d have paid about $4731 for a liquid that one aftermarket vendor told us was “cheap” to make. For some perspective, gasoline costs about $3 per gallon (at the moment), while a gallon of Beluga caviar (imagined as a liquid) costs about $18,000—surprisingly, only about four times as expensive as good old printer ink. We researched both online and brick-and-mortar tech outlets to find printers that are being used now by high numbers of consumers. We didn’t test color inks because that would have introduced too many variables that might skew the results. For instance, some printers use separate cartridges for each ink, while others use single, tricolor cartridges. A standardized test might not drain the colors evenly, which might give one printer an unfair advantage. Tony Leung, Senior Data Analyst in the PC World Test Center, weighed each black ink cartridge (to an accuracy of 0.001 gram) to determine the cartridge’s initial weight. We then printed pages until the printer, in response to the low level of ink in the cartridge, prevented us from continuing. When each printer stopped printing, we removed and weighed its black ink cartridge to determine the cartridge’s out-of-ink weight. Then we removed all of the remaining ink from the cartridge (including the small sponges found in some cartridges), put the cartridge on the scale again, and measured it’s true-empty weight. We tested Canon’s Pixma MP610 multifunction printer with black ink cartridges from Canon and from G&G, an aftermarket brand owned by Ninestar Image. The differences in performance between the OEM ink and the aftermarket ink were striking. With the Canon cartridge installed, the printer stopped printing when 24 percent of the ink remained in the tank. Specifically, the full tank of ink weighed 27.333 grams, and the unused ink in the tank at nominal empty weighed 6.459 grams. When equipped with the aftermarket G&G cartridge, the Canon printer shut down with nearly 45 percent of the ink left. The full tank of ink weighed 27.320 grams, and its remaining ink weighed 12.277 grams. G&G told us that it tested three of its color cartridges—magenta, blue, and yellow—and found that the amount of residual ink ranged from 5.5 percent (for yellow) to 17 percent (for magenta). (Again, we limited our testing to black ink cartridges only.) Canon declined to comment on our test findings with the G&G print cartridge.